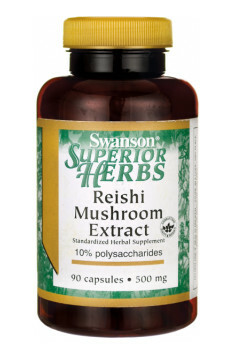 Swanson Reishi Mushroom is a dietary supplement in capsules, containing 500 mg of a Reishi mushroom pericarp extract, standardised to a 10% polysaccharide content. In modern Far East medicine, Reishi mushrooms are used as an agent strengthening vitality, regulating the organism’s immunity and exhibiting beneficial properties in terms of neoplastic diseases. Reishi mushrooms occur naturally in Japanese and Chinese mountain areas, densely wooded, characterised by high humidity and low sun exposure. Because of conditions difficult for development, it was an extraordinarily rare and poorly accessible species but their healthy properties made them more valuable than gold. Scientific and clinical studies would allow confirming their positive effects on health. Traditional Eastern medicine considers Reishi mushrooms as an adaptogen, an aiding agent and a natural equivalent of immunotherapeutics. It is believed to have a blood pressure reducing, antitussive, expectorant, antimicrobial, antiviral, antifungal, anticancer and anti-allergic properties. Such a wide range of applications, able to prevent and alleviate many ailments and contribute to increased longevity, is perfectly known and highly valued in the countries of the Far East. They have been frequently used as the last resort in fights against incurable and severe diseases, mainly neoplastic ones. So far, more than 300 reports have been published regarding chemical components in Reishi mushrooms and related species. Their pericarp and spores contain around 400 different bioactive compounds, such as triterpenoids, polysaccharides, nucleotides, sterols, steroids, fatty acids, proteins, peptides and trace elements. The pharmacologically most important active compounds present in Reishi mushrooms are polysaccharides. They exhibit immunostimulatory and anticancer properties. Another group of substances isolated from Reishi mushrooms, relevant because of their health benefits, are triterpenoids, especially ganoderic acid. Research shows that they have an adaptogenic and analgesic effect, maintain normal blood pressure, inhibit cholesterol synthesis, protect the liver from toxins and are responsible for the mushroom’s anti-allergic properties. It has also been determined that triterpenoids have an anticancer and cytotoxic effect. Reishi mushrooms were traditionally recommended by Chinese and Japanese herbalists for insomnia as a “sleep-inducing agent” and in the case of psychiatric and neurological ailments, including muscular diseases, lack of appetite and weakness after a long illness. Dried Reishi mycelium turns out to be a highly efficient tool in treating neuroses caused by environmental stress. An 8-month study on patients with Alzheimer’s disease showed that patients who used Reishi experienced a significant health improvement. Reishi mushrooms contain a high concentration of organic germanium compounds, polysaccharides and triterpenes. The active components have demonstrated their ability to strengthen cells of the immune system and improve the system’s functioning. Reishi mushrooms exhibit antiviral and antimicrobial properties. They prove effective against flu viruses and bacteria of the Pneumococcus, Streptococcus, Staphylococcus, Escherichia coli groups, as well as bacteria responsible for dysentery and those of the Pseudomonas group. Polysaccharides contained in Reishi exhibit a beneficial effect in people infected with the Epstein-Barr virus, responsible for mononucleosis. Ganoderic acids are effective against HIV; small doses can inhibit its replication even by 50%. Stimulation of the immune system consists mainly in an increased activity of scavengers. The active anticancer component contained in Reishi mushrooms are beta-glucans. These polysaccharides are large molecules consisting of smaller subunits of simple sugars bound with amino acids. They are able to stimulate the immune system and modulate it by activating cells of the immune system (macrophages, T lymphocytes) and an increased response to foreign cells (bacteria, viruses, cancer cells), caused by an increased level of immunoglobulins. -as a supplement improving life quality and longevity of patients with cancer. Numerous adaptogens, Reishi mushrooms in particular, owe their properties to a remarkably high content of organic germanium compounds. Thanks to that, oxygen uptake and management is utilised more efficiently by the organism, which, in turn, increases resistance to the harmful activity of free oxygen radicals. The main components of Reishi mushrooms responsible for their adaptogenic properties are ganoderic acids, 1,3-beta-glucans, organic germanium compounds, adenosine, and gamma-aminobutyric acid. Adenosine has a relaxing effect on skeletal muscles, calms down the nervous system and prevents the stimulatory effect of caffeine. To sum up, Swanson Reishi Mushroom is a dietary supplement recommended for preventing and aiding therapy of cancer diseases, and improving the organism’s general immunity. The product’s adaptogenic properties can reduce the negative consequences of chronic mental and physical stress for the organism. They also contribute to the regulation of the organism’s homeostasis, balance in the nervous system, they affect health improvement, good well-being and physical capabilities. Reishi Mushroom 500mg 90 caps. One capsule 1-2 times a day. Do not exceed the recommended daily dose. Regular use of the preparation and following the recommendations may contribute to facilitating removing toxic substances from the organism, increasing immunity and stabilizing blood lipid profile. It is safest to start from 1 capsule a day. After 2-3 days of use, the dose may be increased to 2 capsules a day. Gelatin (capsue), Carrier (Maltodextrin), Bulking agent (Microcrystalline cellulose), Anti-caking agent (Magnesium salts of fatty acids, silicon dioxide).